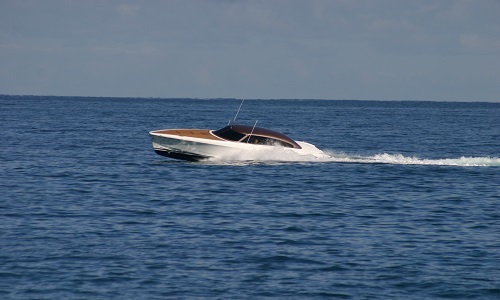 FOR SALE: This bespoke Convertible Sports Tender was custom built for someone with discerning taste. 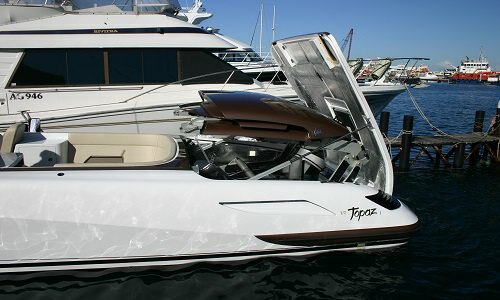 It is a 50 knot boat with the roof up or roof down. It is the only one of its kind, built by Vikal to exquisite standards. It is practically unused and in as new condition and is now offered at less than half of its replacement cost. It is the most exclusive island hopper you will ever see in the Riviera. We built several mock-up roofs or parts thereof to establish what to do and how to. It was a lengthy process of cobbling together and testing prototypes. The geometry had to be developed and from there the parts were machined from billets of T6 aluminum and stainless steel. The hydraulic rams were custom made in stainless steel. The moving parts are controlled using 60 limit switches and 5 string pods which measure travel and report back to a PLC (programmed logic controller). The PLC had to be custom programmed and this job took many weeks of trial and error. As far as we are aware, this is the first time an auto inspired triple panel folding convertible roof has ever been built for marine use. 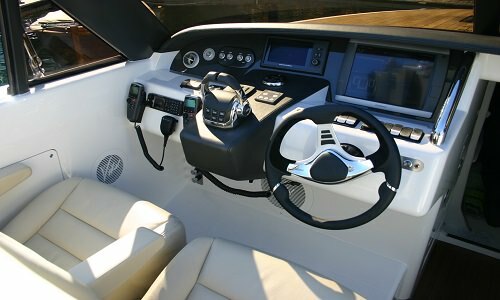 The end result is a stunning and sleek 50 knot convertible Sports Tender. It is a thing of great elegance, beauty, engineering and style.